I am at 3rd week of "maidless" days, so far still coping well. Although is exhausted but I am perfectly fine with physically tire comparing to the mentally stress that I had been thru for the past 9 months with the fights between mil and domestic helper. During that period, I was in mixed feeling, looking forward to go home after work and see my little kicker but at the same time, felt so stressed cos may need to listen to the complaints from mil or domestic helper or even both of them. So at least I am free from these complaints now but of course, stress with sourcing domestic helper, is really not easy to get one now. Another helper threw in white tower when she was on the way to my place with the agent, she didn't even step into my house to meet us yet! The domestic helpers are more choosey and fussier than employers! Another cut queue post, need to post this up 1st as I have received requests for recipe. Especially for my department gal since she is organising a birthday celebration for her boy, so she want to include this cookie dough cheesecake bar in her party menu. I baked this for my little kicker's 1st birthday celebration, the dinner started at 5pm and I baked this only at 2pm plus while I was still rushing for the decoration of the Lightning McQueen car cake. Dear husband frowned when he saw me rushing like crazy woman, he said I should have forget about baking this and just focus on the birthday cake. As usual I turned a deaf ear lol, I just carried on with my baking. Recipe adapted from Bisousatoi and My Baking Addiction, originated from The Essential Chocolate Chip Cookbook. 2. Mix the melted butter and digestive biscuit crumbs until thoroughly combined. Press the mixture into the bottom of the prepared pan. Bake in preheated oven for 6 minutes. Remove pan to a cooling rack. Do not turn your oven off. 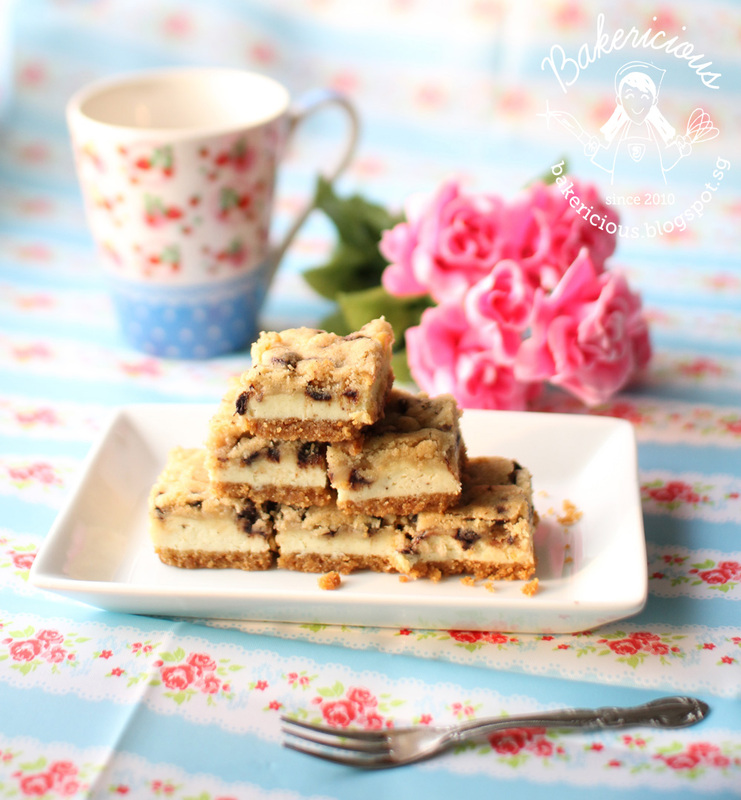 The married of digestive biscuit base and cheesecake and cookie dough are perfectly match. The crunchy digestive biscuit with creamy cheesecake plus the buttery, chocolaty cookies dough, really taste heavenly. This bar is highly addictive, I promised you will not be able to stop at just one piece! I received so much compliments during the party, I have guests who were so full but still forced themselves to squeeze in another piece, and one more piece and the last piece (hahahah...funny right) cos is just simply too delicious. I baked 3 times in total, to share with my colleagues and also dear husband that had requested for his colleagues too. During the distribution of the bars, my sales directors were actually on the way to attend meeting but they turned back to ask for 2nd serving lol. Everyone given thumbs up. Jess, I am convinced that this is delicious. Going to bake it this weekend! Hi, Jess, I haven't seen you updated your blog for such a long time, looks like you have been stuck with house chores! My cousin in Malaysia always have the problem to get the right maid as in the past, her Indonesian maid were either sick or not knowing cooking??? Man, that means my cousin had to cook for her, hahaha, but after few years of bad experience, she has enough & now she is doing all by her own! Oh, mustn't forget to mention that I don't normally see cheesecake bars, a new idea to me instead of making a proper cheesecake, thanks for sharing! 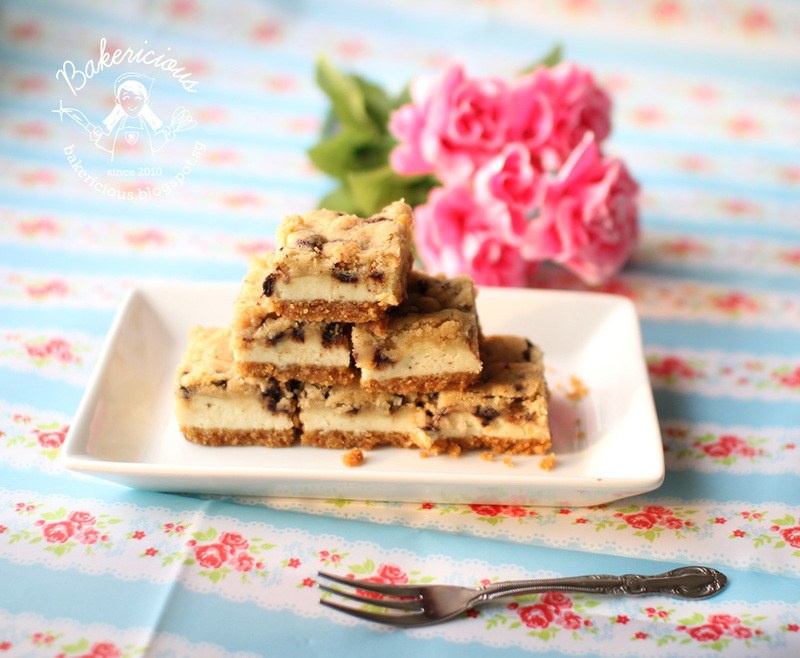 I enjoy cookie dough ice cream so I think this cookie dough bar would be just as delish! Buttery and addictive! Fantastic clicks. Maid issues are tough to settle. Have them also problem don't have them also problem. These days, the expectation from them are so different from last time. Gone are the days, they are seriously hoping to earn money and make a better tomorrow. These days, they are all very short sighted. Hope you will get a good one eventually. Anyway, I have already bookmarked and will making on this weekend to welcome home my hubby. These delicious bars seems to be nice to cheer everyone. This is lovely cookie dough cheesecake bars. I am glad i pop in and found this lovely recipe of yours.